When you’re tired of the hustle and bustle of the resorts of Tenerife head on an excursion to the Mount Teide National Park. If you have a taste for awe-inspiring views or would like to stand 200 metres from the mouth of a dormant volcano then the Mount Teide National Park is a place you simply cannot afford to miss. One reason to head to Mount Teide National Park is to get far away from the crowds of Playa De Las Americas and Los Cristianos. You’ve played hard and you’re going to need some time to recharge your batteries before you head back for the next round of clubbing and surfing! Luckily, it’s extremely easy to move between the resorts on the coast and the scenic natural beauty of Mount Teide National Park. You can easily get there by hire car and, if you’re feeling fit, you can even cycle there. Once a day TITSA, the bus company that services Tenerife, ferries people from Playa De Las Americas to the park and then does a pickup in the evening. You can walk the trails of the national park to your hearts content and still be back in time to pull on some nice clothes and head to the hot night spots! In terms of accommodation, the place to stay is at the Tenerife Parador Hotel which stands at 2000m above sea level in the park itself. However, most visitors choose to stay in a resort hotel on the coast and travel to Mount Teide during the day. You won’t run out of things to see at Mount Teide National Park; this park covers over 130 square kilometres and presents the visitor with a range of plant life and animal life that is incomparable to anything you might have seen elsewhere. With over four million annual visitors, Mount Teide National Park is the most visited national park in Spain. You can’t hear about the park without hearing about its star attraction, Mt. 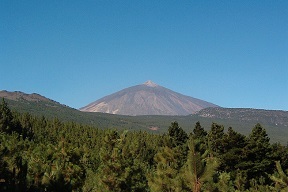 Tiede, the world’s third largest volcano. This dormant volcano is the highest mountain in Spain and it serves as a backdrop to the partying life of the Canary Island resorts. Its slopes begin just 13 kilometres from the beach. You can walk up Mt. Tiede and many tourists do so. There are many trails you can follow and several challenging climbs that can be mapped for you. The best place to get information on this is at the park centre where you can also find out what areas are inaccessible due to rare inclement weather. You can ascend the volcano by the Mount Teide cable car, called the Teleférico Teide. In just over eight minutes this cable car will take you to just 200 metres from the summit. With a pre-arranged permit, however, you can walk up to the very mouth of the dormant volcano itself. To get the permit you have to contact the Park Administration office in Santa Cruz (c/ Emilio Calzadilla, 5). Take a photocopy of your passport to get the free permit which will specify the date and time you can visit the summit. Limiting visitors in this way protects this extremely fragile ecosystem. The second highest peak, Pico Viejo, is also accessible to the public but be warned that it is a strenuous undertaking. When you combine the slippery scree fields, an extremely steep path and the very strong winds of the summit Pico Viejo is a more isolated location but if you’ve climbed to the top you’ve definitely done something to be proud of. Besides Mt Teide and Pico Viejo be sure to head to the rock formations of Los Roques de Garcia. Here you can see the work of thousands and thousands of years worth of erosion, where the wind and grit sculpt eerie and strikingly beautiful shapes out of standing pillars of rock. You can also see what has been called the world’s most photographed rock, the Cinchado. The Cinchado is a red rock with a slender base. One day the wind will wear enough out of the base that the top will fall so you should see it while you can! A fascinating alternative to the standard day excursion is to see Mt. Teide by night. This begins with a meal at sunset and then you are transported by jeep through the mountains. As you go higher you’ll see the stars as you’ve never seen them before. This stargazing trip is even guided by a qualified astronomer and if you have someone special you should definitely take them with you! Do keep in mind that this is one of the highest places in Spain and dress accordingly. Even if the morning starts out balmy bring something warm to wear because as you go up in altitude you’ll find the temperature dropping substantially. You’ve come to the Canary Islands to have a good time but don’t forget that there are lots of varieties of fun. The scenic beauty of Mount Teide National Park is waiting for you and, from the resorts, it’s just a bus ride away!